Your destination for cool, fun, and free online resources to use for personal development and enjoyment. What are all of these Resources? Part of being successful academically is being able to take a break and do something for yourself besides coursework. This might be a 5 minute study break or learning something new that isn't for a class assignment. 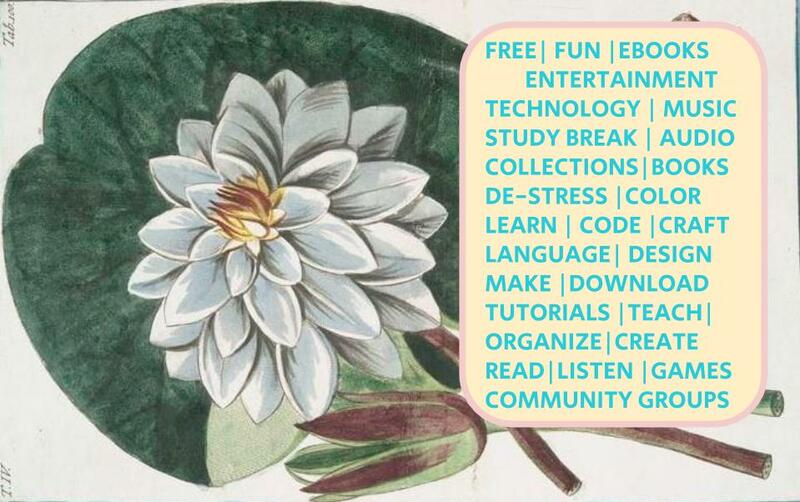 This is a guide to all kinds of free resources that are available online that are meant to help you take that break and take care of yourself. Use some of these resources to have fun, discover, learn and try new things, get organized and find your community. Whether you are looking for something fun to do without having to go out, or you are looking for a fun group to meet with in the community this can be a great place to begin. If you want to learn a new subject or improve your crafting skills, there's something here to help you get started. If you are looking for inspiration there are free digital collections of books, images, and recordings. Use this to help you take a break from studying when you feel overwhelmed, when you feel like trying something new, or to learn something for the sake of learning. There are also some tools for after your study break to make studying fun.